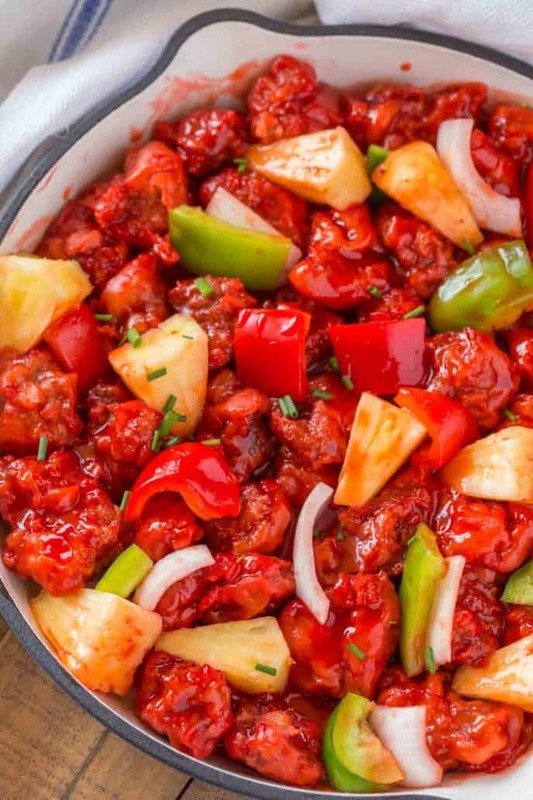 Sweet and Sour Pork with crispy pork, pineapple, bell peppers and onions just like your favorite Chinese takeout. We love Chinese recipes in our house and on the blog including our favorites, Chicken Lo Mein, Easy Mongolian Beef, Panda Express Orange Chicken (Copycat) and Crab Rangoon. Crispy Sweet and Sour Pork is an easy classic Chinese recipe that always looks more intimidating than it is. With an easy batter and quick sauce, this recipe is delicious and crispy. One of the most frustrating things about ordering Chinese food from your local takeout place is the steam factor. You know, the second that food is packed in a to-go container it immediately starts STEAMING. 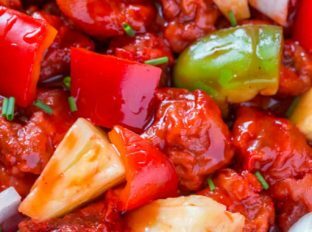 Make this Sweet and Sour Pork and avoid the mushy steamed fried pork bites that super glue to each other! 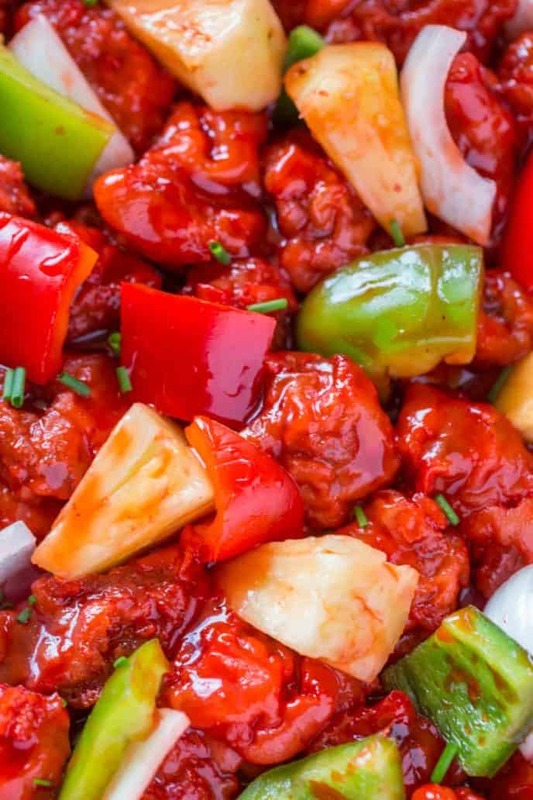 Homemade crispy battered Sweet and Sour Pork (or chicken, shrimp, tofu or beef) is the next best thing to going out to eat at your favorite Chinese restaurant. 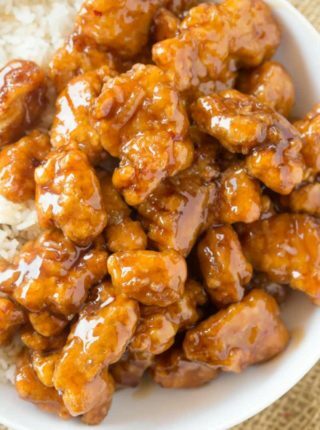 Sweet and Sour Sauce is as easy as bringing a few ingredients including pineapple juice, brown sugar, mirin and soy sauce to a boil before adding a cornstarch slurry to the mixture to thicken it. 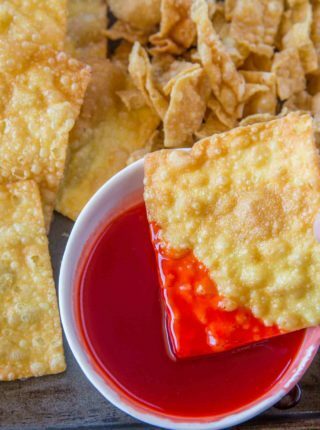 The classic red color from sweet and sour sauce comes from red food coloring (which is completely optional). 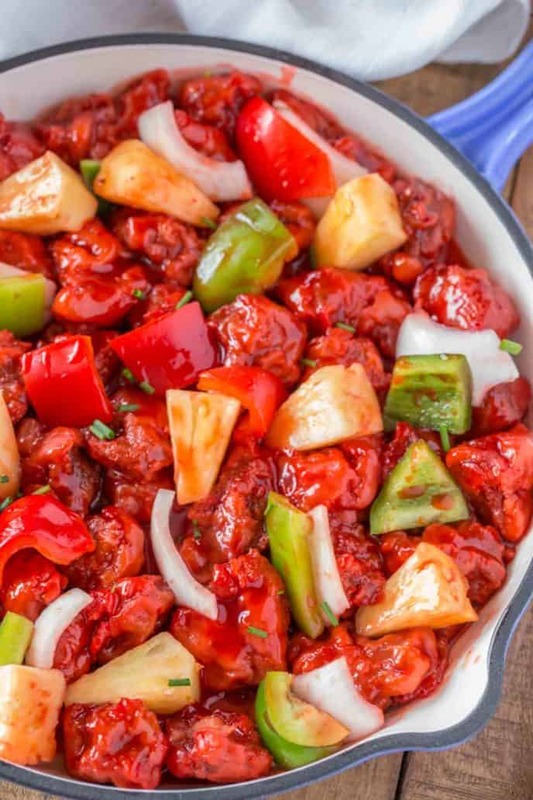 Picking the vegetables for Sweet and Sour Pork is not hard, a good mixture of green, red and sometimes yellow bell pepper chunks with onion and pineapple mixed in. With vegetables some refer to this recipe as a Sweet and Sour Pork Stir-Fry, so go ahead and add any vegetables you’d like. If you want all sweet flavors skip the green bell pepper chunks which can be bitter. If you want the onion to not be as strong, soak the chunks in ice water for 20 minutes before adding to the pan. Use ripe pineapple chunks. If you worry about the acidity, cook the chunks for 2-3 minutes longer. 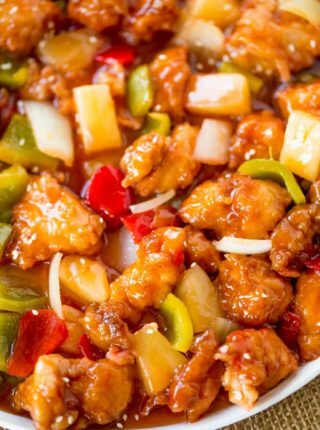 Sweet and Sour Pork with pineapple chunks and juice make this recipe a huge hit in our house. I use fresh pineapple chunks in the skillet and canned pineapple juice for the sauce. If you have a particularly juicy pineapple you could of course juice the rest of it yourself but I prefer to snack on the rest of the pineapple while cooking. 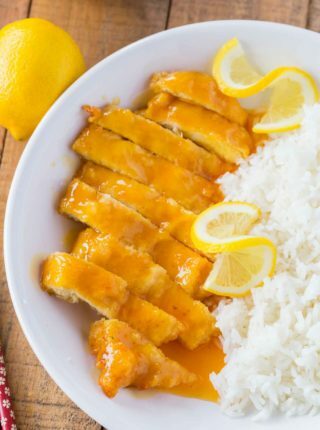 To make the sauce, whisk together the pineapple juice, brown sugar, rice vinegar, ketchup, soy sauce, food coloring (if using) and cornstarch. Heat three inches of cooking oil on medium high heat until a piece of pork would immediately start bubbling when added. Coat the pork in the cornstarch, then dip in the egg and into the flour before dropping into the hot oil one piece at a time. Cook the pork for 2-3 minutes, until cooked through and crispy. Cook in batches until done, removing to cookie sheet. To a large skillet on medium high heat add 2 tablespoons canola oil, the bell peppers, onion and pineapple and cook for 2 minutes, until crisp-tender. Add in the sauce and let thicken, then add in the pork and toss just before serving. Recipe does not say what to do with the soy sauce. I added it to sauce ingredients and it came out fine. Thanks for catching that! I edited the recipe card to include it. So glad you enjoyed it. Amazing. I substituted crushed tomatoes for the ketchup to reduce the sugar. Otherwise followed it to a “t”. Perfect! I’m making this right now and it’s delicious! What a great recipe! I cannot wait to make this. YUM this looks delicious!! Must try soon! Hope you enjoy it Jamielyn! That looks incredible! My family would LOVE this! This looks so flavorful and amazing! !